A truck carrying away demolished stalls. Stalls around the Stabroek Market area were Sunday morning demolished and badly clogged drains cleaned, leaving the more than 100 vendors divided with some saying they feel politically betrayed by a government they voted for. Clothing vendor, De Jonge suggested that the aim is to make the place more attractive for tourists but he urged government to always remember that it was Guyanese who voted for the coalition-led administration. “Not because you get a new local government you have to cast us away like if we are dogs on the street; we need a living too. We are Guyanese, we are not foreigners. You can’t look to suit the foreigners and leave the Guyanese out. When they had wanted us, it was Guyanese people from right off the road here out them there,” said Brian De Jonge who has been vending at the Stabroek Market area for more than 25 years. He lamented that the removal of the vendors has come at a time when Guyana’s economic activity was in tatters and could not depend on a trickle of tourists. “We done already suffering with this economy. It’s a down-down economy. I don’t care how they boost it up with tourism; right now tourism cannot boost this economy because it is not every day you get tourism but Guyanese have to survive everyday,” he said. “Since the new government, the present situation of the economy in this country is dead; there is nothing much for poor people to survive right now and you will take the little we have to get nothing,” he said. The vendors are not convinced that the vacant lot would be a source of lucrative business because it is far away from the business centre. “They make plans and promise the people all sorts of things- the moon and the stars- and after they finished voting at the elections, look the backlash that they are getting,” she said. Georgetown Mayor, Patricia Chase-Green, who spearheaded the operation, appeared hardly worried about a political backlash from a number of vendors who complained that they would end up being jobless and could not enjoy the good life that the David Granger-led coalition promised for the 2015 general and regional elections. “Political votes would not be lost in my opinion when what we want to put in place is put in place and people operating from there. No country you get satisfaction from everybody but you have to start somewhere,” she told Demerara Waves Online News. Chase-Green appealed to the vendors to “work with us” in making the area a better place. Overseas-based Guyanese, Richard Wray, who was in the area as part of a private visit to his homeland, welcomed the decision by the Georgetown City Council to restore the area. “This is a historic area. It needs to be kept clean and accessible to people in emergency situations as well and this is part of the history of Guyana and they will come to appreciate a clean environment that this place used to be 30 years or so,” he said. More than 100 vendors who ply their trade on the western pavement alongside Demico and across the drain on car park would not be allowed to sell there for at least the next four months, Chase-Green said. Vendors, who have stalls in the market, have already received notices that they must occupy their stalls. “Those that have stalls have to return to their stalls in the market, arcade, behind the fire station and inside the market- you must return to your stalls,” the Mayor said. However, vendors were concerned that the vacant lot at the corner of Hadfield and Lombard Streets has not been prepared for them and more so were out-of-bounds from the major path of existing and potential customers. Among those to be relocated are the headwear, bread, phone card, and cellular phone accessory vendors. There were also vendors who praised the exercise by the Georgetown City Council. 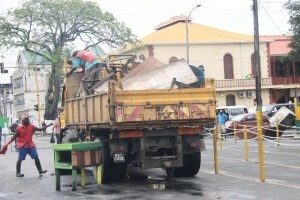 “The clean-up is very good because the vendors have the place very dirty. We asked for a change and we are seeing change,” one vendor said. 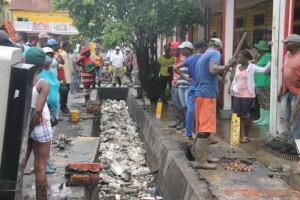 One of her colleagues said “I love the clean-up by the President, Mayor of whosoever doing it because plenty vendors when they finish selling in the afternoon, they gone home and leave the place real nasty and stink and this is not Guyana,” she said. When the rickety wooden stalls and covers over the western drain parallel to Demico were removed, all that could be seen were stagnant water, innumerable Styrofoam boxes and other types of solid waste. Several truckloads of waste were carted off to the Haags Bosch landfill site, leaving the area clean. “The place feeling light already,” remarked a vendor who participated in the clean-up exercise. Many vendors said they participated in the clean-up operation although they knew that they would be removed. Mayor Chase-Green pointed to the centuries-old historical value of the Stabroek Market and Demico area that is related to Brickdam and the 1763 Monument at the Square of the Revolution. She noted that Guyana was observing its 50th Independence Anniversary and it should be done with pride.